The Arlington Artists Alliance's summer show, "Dog Days of Summer @ Century 21" runs August 1-31 at the Century 21 Gallery, 1711 Wilson Blvd, Arlington. The opening reception is Friday, August 1, 6-9pm. Both 2-dimensional works (paintings, drawings) and 3-dimensional works (pottery and glass works) will be shown at the opening reception. For the rest of the show, only the 2-dimensional works will be on display. 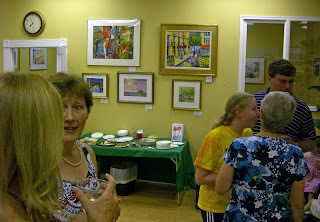 The opening reception of the Arlington Artists Alliance's show earlier this year displayed some beautiful works and attracted a large crowd. Karen Tarlton's "Fragrant Flowers" caught my eye immediately when I entered the gallery. Must have done the same for someone else, because the painting had sold by 8 pm. Two of Linda Donaldson's works, "Metropolitan Museum: Brief Encounter" and "National Gallery: Joe & Friend," showed an old man looking at figurative art that featured beautiful women. Reminded me of how I sometimes feel riding my bike through Georgetown. My favorite work in the show was Linda Maldonado's "Heaven's Gate." It moved from a gate into a circle of text in an abstract piece that seemed to me to be a modern transformation of Byzantine art.